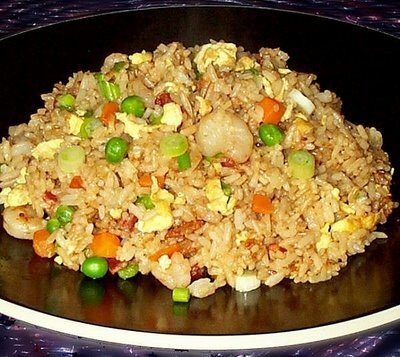 Nothing looks more impressive than a large platter of Nasi Goreng. It can be a very economical dish, depending what you add to it: Make it more luxurious by adding prawns, keep it vegetarian, or use leftover meat, fish or poultry. I prefer to put some veggies in for color too. Use a wok or very large frying pan for easy cooking. Cook the rice in the water with the stock for 15-20 minutes. Once cooked, allow the rice to cool. Stir-fry the onions in the oil until beginning to brown. Add the chicken breast strips and continue cooking over a high heat until the chicken is just done, no more than 5 minutes. Lower the heat and add the garlic, Coriander Pesto, ginger, and chillies. Sauté for one minute to develop the flavours. Add the soy sauce, cooked rice and the prawns. Warm through while stirring to prevent the rice from sticking. If you want, top the dish with fried eggs, dusted with Cajun Spice. This entry was posted on July 11, 2010 at 7:48 am and is filed under Cooking, Family, Friends, People, Random, Recipe with tags chicken breasts, chicken stock, ginger, Nasi Goreng, onions, pesto, prawns, rice. You can follow any responses to this entry through the RSS 2.0 feed. You can leave a response, or trackback from your own site.